Angel wing begonias (Begonia coccinea) are succulent, tropical plants. The stems are cane-like, resembling bamboo. The thick leaves are green with white markings and burgundy-colored underneath. The wing shapes of the leaves give this begonia variety its name. During the spring and summer, small blossoms hang in clusters beneath the leaves. Place your angel wing begonia in a room with daytime temperatures between 66 and 73 degrees Fahrenheit. The ideal night temperature is 55 degrees. Locate the houseplant in an area with bright, indirect light. Direct sun will scorch the leaves. Pour water through the top of the container until it runs out the bottom. Allow the soil to dry a bit on top before watering again. Reduce the amount of water given to the angel wing begonia during the darker, colder months of winter. Feed the angel wing begonia with 10-10-10 water-soluble fertilizer. Use the fertilizer at half-strength and apply at every other watering. 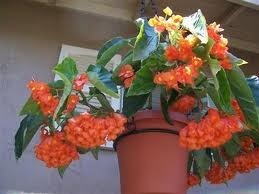 This helps the begonia to maintain strong growth. Pinch the branch tips to promote the growth of more branches. Once the angel wing begonia is full and bushy, stop pinching. Drive a tall bamboo stake into the soil next to the stem. The height of the stake should equal the desired height of the begonia. As the stems grow taller and begin to flop over, tie them to the stake with a soft cloth. Cut the extra long branches back with a sharp knife in the spring. This encourages growth at the base of the angel wing begonia. This tropical plant will reach 10 feet tall if left unpruned. Repot the angel wing begonia once a year in the early spring. Plant the begonia in a container that is only 2 to 3 inches larger than the previous container. Use commercially available potting soil. This refreshes the nutrients around the roots and gives you the chance to divide the plant if it is overcrowded. Large leaves that fall off or are removed can be rooted in a glass of water. Change the water each day and keep it in indirect light. Once the roots grow 3 to 5 inches long, plant the new angel wing begonia in a plant pot full of soil. Do not overwater the angel wing begonia. Do not let the plant sit in a saucer full of water. Waterlogged soil will rot the roots of this tropical plant.